The window films we stock, along with our eco friendly water based latex printers give you the widest choice of films. Contravision can offer vibrant full colour images on a one way view film, or our optically clear can give the effect that images are printed direct onto the glass. Mix this with our wide format vinyl cutters and whatever you can think of we can do. Custom cut frosting film is an ideal material for office branding. 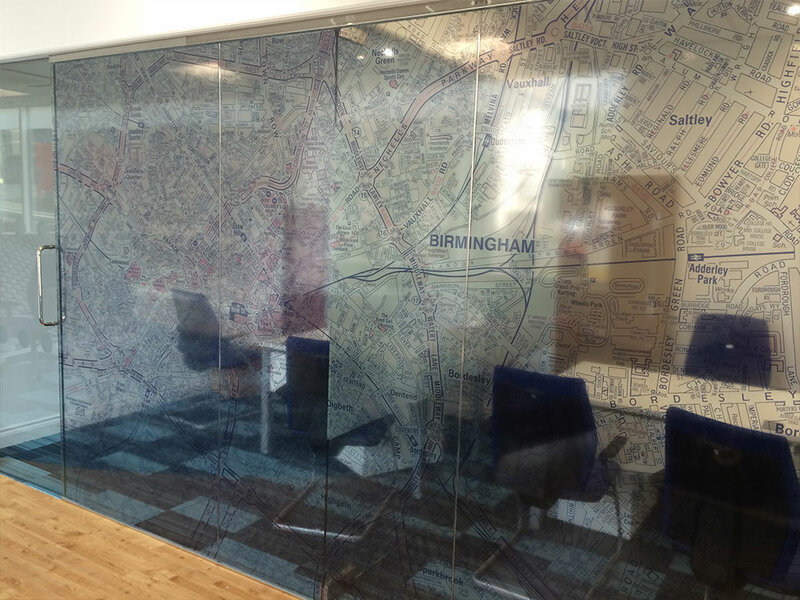 The frosted film can be contour cut to pretty much any shape, pattern and size, and can achieve many different levels of privacy or used purely for branding purposes. We can also print directly onto the frosting to give really unique and high end results. Call our team for free friendly advice. Interested in our custom cut and printed film? Get in touch with our team for a FREE quote on 0161 884 0572 or send us an enquiry online.